Lefkadios Hern Studios, Lefkada - About our studios, Lefkada Greece, accommodation, rooms, Ai-Yiannis Lefkada. Few words about Lefkadios Hern studios. At a distance of only 14 km from Aktion airport, 1.5 km from Lefkada town, nearest beach 1km, our studios are in the middle of everywhere. Bus stop, fish taverns, cafe and mini markets, are found also at short distances. Lefkadios Hern complex comprises of 18 spacious and stylish rooms, that can accommodate from 2 to 4 persons and which are traditionally and elegantly built, according to the insular simplicity. The units feature amenities such as television, refrigerator, kitchenette and of course private bathroom. Useful services like wifi, fax, maid service, free parking, kite and surf spot are also available. Very close of the complex there is the main road and only 7 min walking lead you to the beach of Ai Yiannis, where you can enjoy the sand and the relaxation admiring the glory of the Ionion sea. Spectacular studios! Excellent service and great cleanliness. All rooms have some interesting sea view. "Outstanding destination for those who love water sports. 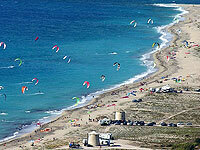 Sailing, kite-surfing and windsurfing activities are only 2 min driving away." STUDIOS FACILITIES: BAR, Parking, Kitesurfing, Windsurfing park spot, BBQ, Wifi-Fax, Sitting area, Maid service. ACCESS BY: Car, Scooter, Bicycle, walk good to: Beach, Kitesurfing, Windsurfing, bars, forest. Pets:Free! Pets are allowed on request. No extra charges.